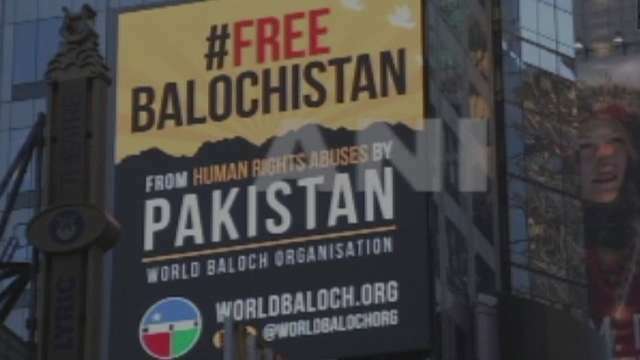 The World Baloch Organisation (WBO) has launched billboards carrying the slogan "#FreeBalochistan from human rights abuses by Pakistan" across the iconic Times Square in the New York City. The billboards up in the heart of New York will remain there as the city celebrates New Years Eve. The billboards highlight Pakistan's kidnappings, torture and massacres in occupied Balochistan and the Baloch people's right to self-determination. "Our aim is to reach out to the American public and make them aware of the worsening situation in Balochistan, which has long been ignored by the international community mainly due to Pakistan's desperate efforts to stop the truth from reaching the international community. Through media reportage of the Times Square New Years Eve celebrations, we hope to get our human rights message across to the American people and the rest of the civilized world," said the chief organiser of the WBO, Mir Javed Mengal. "We appeal to the people of the world to raise their voice against the injustices against the Baloch people who continue to strive for their basic rights and self-determination. We also appeal to the United States and UN to take notice of the crimes against humanity being committed by Pakistan and hold it accountable for violating international laws and covenants," Mengal added. Pakistan has not allowed the international press, human rights monitors and aid agencies to enter Balochistan. The adverts seek to raise awareness about the plight of the secular Baloch people who have suffered gross human rights abuses by the Pakistani authorities for several decades. The billboard adverts are part of the ongoing human rights campaign in the city, which kicked-off with more than 100 taxis carrying similar slogans. The awareness campaign in New York City comes after a successful month of implementing the campaign in London, UK.